Writing Prompt: In this scene, include something that your character is afraid of. "I think that I just erased the mental image of Sarah making out with Taylor from my memory." Maria nodded with approval after reading her favourite baseball comic book. After putting down one of the volumes, Sarah knocked on Maria's door and opened it. As soon as Maria saw Sarah again, the mental image returned to her and made a squeamish sound. Sarah sighed, annoyed, knowing exactly what Maria was thinking. "That's what you get for barging into my room unannounced. I don't feel sorry at all." "Put up a sign or something." Maria argued as they descended down to the dining room. "Knock at least, like what I just did." Sarah shook her head. "Manners and common sense, Maria." Writing Prompt: Write about an awkward social encounter. "I don't understand this problem at all!" Maria took her eraser and removed her answer to the math question in her notebook. There were already markings from previous attempts, and she scratched her hair in frustration. "I give up. I'm going to ask Sarah for help." Maria took her textbook and notebook, and walked down the hallway to her older sister's bedroom. She yelled as she opened the door, "Sarah! Can you please help me with this problem? I've been stuck for 30 minutes already!" Maria's mouth dropped open, and her eyes wide with shock as she witnessed Sarah and her boyfriend in a make-out session on the bed. Sarah noticed her younger sister at the doorway, and gently pushed her boyfriend away from her, frazzled. "Maria, the least you can do is knock!" I used a random writing prompt generator to get some inspiration for this... Hope you enjoy! "Sorry I hung up on you." Those were the words that I kept on telling myself all throughout the night after the fight. "I didn't mean to say it. The words just simply came out in the heat of the moment. I hope that you can forgive me for everything." I spun my chair around at the desk to look at the body pillow on the bed. "Will you forgive me?" Then after a brief moment, I threw a glass of water at the pillow dripping onto the mattress. "Why are you giving me the silent treatment!? Say something!" I found this random writing prompt and decided to write a bit about it for fun. Hope you enjoy! "A mysterious death occurs. Your character realizes no-one will listen to what he's saying." I saw it with my own eyes. The murderer who killed my sister. She hid me in our closet just moments before as I peeked through the gaps in the door to see a person in a long coat and hat walked in through our front door. They talked for a bit before she struggled against him, and eventually choked her to death. As I held my breath to not alert the murderer, I leaned back against the back of the closet unsure of what to do. As soon as I couldn't hear his footsteps anymore, I pushed open the closet doors and rushed over to my sister to try to wake her up by shaking. "Britt! Jen! Do you have everything with you? Your allowance?" Jen looked through the screen door. "Yes, Mom." Britt had their mom inspect her backpack and put a cap on her head before opening up the door to let her go. "Be home as soon as the math class finishes for dinner. Jen, you do have the money to get you and your younger sister lunch, right?" "Of course, Mom. I just said that I did." Their mother pointed at Britt and Jen and yelled, "Be sure to hold your sister's hand, Britt!" Britt looked down as their mom's voice carried across their neighbourhood, and she was sure their neighbours heard her. She held her older sister's hand. "Mom's a worrywart, but there's no worry. We both have each of our backs, right?" 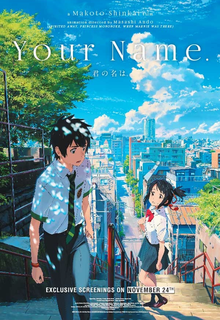 I watched a Japanese animation movie recently in theatres called Your Name (Kimi no Na wa). It was released in August 26, 2016. It starred Ryunosuke Kamiki and Mone Kamishiraishi, and directed by Makoto Shinkai. I re-watched the Gantz live action movie recently. I remembered that I had watched it near the time of release years ago, but I had an itch to revisit the series so I want to watch the live action movies and re-read the manga over again. 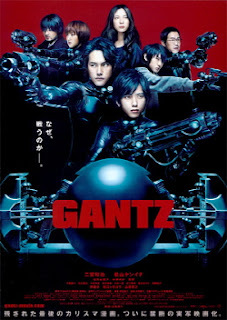 Gantz is a two part movie series, and this blog post is about the first movie released in January 29th, 2011. It was directed by Shinsuke Sato, and starred Kazunari Ninomiya, Ken'ichi Matsuyama, Yuriko Yoshitaka, Kanata Hongo, and Natsuna Watanabe. The Gantz series was created by Hiroya Oku. I randomly thought of this idea while walking in a mall recently... Hope you enjoy! Every so often, I would go to the mall, sit down on a chair out of the way and watch people go about their day from my view. The amount of people looking down on their phones as they walk boggles my mind. Look over there at that lady who almost walk right into the pole, clearly shaken by the abruptness in her obstacle. She looks around in a hurry as if to see whether anybody had seen her foolish action before carrying on with her composure back to normal. But in fact, there was at least one person watching and laughing at her. Me! It's those moments that makes it interesting to see how people react when they least suspect. 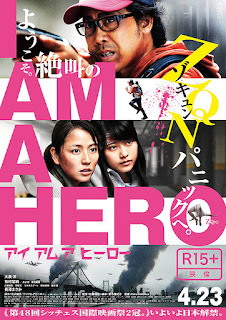 Then someone comes up to me, and I look up at a girl presumably around the same age as I.
I watched a Japanese movie, I Am a Hero, around the same time as I did with Train to Busan. Coincidentally, they were both zombie movies which I don't often watch that type of genre. The Japanese movie was released on April 23, 2016 and was directed by Shinsuke Sato. The movie starred Yo Oizumi, Kasumi Arimura, and Masami Nagasawa. I rarely watched Korean movies, and I believe this is the first time I am writing a review of sorts for one. Since this movie takes place in the apocalyptic zombie setting, this makes it even less likely for me to watch as I don't really watch zombie movies. Moving on, I randomly stumbled upon this movie and decided to give it a shot. 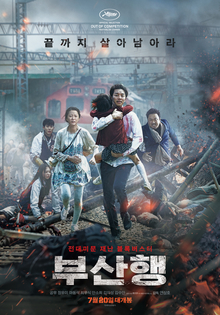 The movie, Train to Busan. premiered on May 13, 2016 at the 2016 Cannes Film Festival. The film was directed by Yeon Sang-ho, and stars Gong Yoo, Jung Yu-mi, and Ma Dong-seok. I saw this writing prompt and found it interesting for me to write on. "You realize you are immortal or more specifically that you cannot die. The issue is that you only realize this once the man who is attempting to torture you to death can't finish the job." I couldn't believe I was in this predicament. Strapped to a chair in a dimly lit basement with the curtains covered and head covered by a black cloth, my fears were fully realized. Claustrophobic. Thantophobic. I didn't even know the time of day. My cries of pain echoed in the empty room. Will anyone hear me? "If you want the pain to stop, tell me what I need to know!" I pleaded, "I don't know what you're talking about. You're misunderstanding!" The bell for recess rang and everyone ran outside wearing their winter coats to the snowy fields in the school playground for their fifteen minutes of freedom before class continued. James hung back being one of the last ones to leave the school building. While he watched his classmates and other students have fun in the snow, James knelt down at a corner of the school playground to play alone. It was always like this everyday. He never had someone that he called a friend since the school year began months ago. "James! Heads up!" A female voice called him and James looked up to see a snowball hit him right down the middle. "Haha! Slowpoke!" The girl pointed her index finger at him and laughed so much she had to clutch her stomach to contain herself. "Nancy. Leave me alone!" He turned around to walk away, visibly hurt.